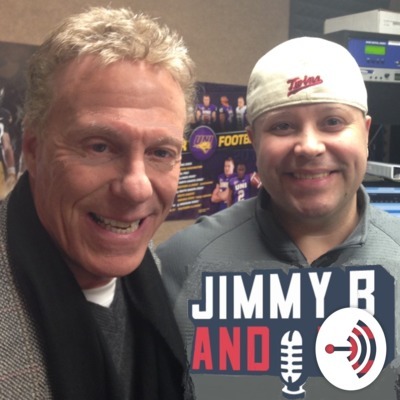 Jimmy B & TC gives a look at the local sports scene across the state of Iowa and nationally with a focus on the Iowa Hawkeyes, Iowa State Cyclones along with UNI and Drake and a regional focus on the professional sports scene including NFL and MLB. The show originates each weekday from 4:00 - 6:00 on 1700 KBGG in Des Moines. Jim and Trent open the show talking about the latest between Iowa, Gary Dolphin, Gary Dolphin and then Noah Fant as Trent comes in hot. Matt Nelson from Wide Right Nattie Light drops by to talk Iowa State football and basketball and then the guys finish making their picks for the week . Jim & Trent open up the program talking about the Iowa/Pitt basketball game and the comments from Gary Dolphin. Pete Mundo from Heartland College Sports drops by to talk about the Big 12 Championship game, Texas Tech letting go of Kliff Kingsbury and Iowa State looking to finish the season strong. Jim & Trent open the show talking about the Iowa State win over Omaha and look to when they get players back from suspension and injury, then talk Monday Night Football, Scott Phillips from NBC Sports then stops in with a deep dive around college basketball and the ACC/Big Ten Challenge and the guys get ready for the night in sports with Tube Talk. Jim & Trent recap what they saw in the Iowa State win over K-State and Iowa over Nebraska, then talk NFL with Tadd Haislop from the Sporting News and a look around the night in sports to finish up. Jim & Trent recap the Iowa State win over Illinois, talk about rivalry week in college football, then get into the Big Ten football and basketball with Ken Silverstein before making their weekly picks. Jim & Trent open up the show talking about a great night in Monday Night Football with the Rams 54-51 win over the Chiefs, Iowa State falling to Arizona at the Maui Invitational, Ryan Van Bibber from SB Nation drops by to talk MNF and the NFL and then the guys get ready for the night in sports. Trent and Jim open the program talking about the Iowa State football loss to Texas and a peak ahead to K-State this weekend, look at hoops and ISU/Arizona tonight, then John Bohnenkamp from the Burlington Hawkeyes stops by to talk about the Iowa win over Illinois and a great weekend from Hawkeye hoops, plus a look at his AP ballot for college basketball. Trent opens up the program talking about the Iowa win over Oregon, Dr. Steven Fuller gives a look at football for the Hawkeyes with this week's Hawkeye Swarm, Lee Sterling of Paramount Sports makes his weekly picks and then Jim drops in as the guys make their picks for the week. Trent and Jim open the show talking Iowa State vs. Texas on Saturday, some college basketball talk and then a look around the Big Ten with Ken Silverstein. John Cannon then drops by to talk NBA and what's happening with Draymond Green, Kevin Durant and the Warriors. Jim & Trent are back diving into the Bears/Vikings match up, Iowa State getting ready for Texas and more on Kirk Ferentz and Noah Fant. Ted Glover from the Daily Norseman gives the Vikings perspective on the big Sunday Night Football game and a look to tonight. Jim & Trent begin the program talking Iowa State and the match up with Texas, the hoops win over Texas Southern and a look to Maui and then some Iowa football talk. Ryan Van Bibber drops by as they look around the NFL and then the guys talk about the upcoming night in sports including Drake getting a road test at Colorado. Jim & Trent recap the Iowa loss, the Iowa State win, the brawl in Ames, John Bohnenkamp gives a deep dive into Iowa football and basketball and the guys finish with a look to tonight and Jim has some thoughts on the Jimmy Butler trade. Jim & Trent open the show talking Iowa basketball and what we saw last night from the Hawkeyes, Lee Sterling drops by with his picks and then the guys make their picks for the week. Jim & Trent talk Monday Night Football and the Cowboys, college football with Iowa State and then get ready for the opening night in college basketball with Fox Sports Aaron Torres. Jim & Trent open up the program talking about the week in the state of college football with Iowa State and Iowa, John Cannon also drops in as he'll join Jim for the show Wednesday and Thursday. Ryan Van Bibber then stops by to look back at Week 9 of the NFL and the Monday Night Football game before the guys get ready for the night in sports. Jim & Trent get ready for the football weekend, talk Hawkeyes with Dr. Steven Fuller in this week's Hawkeye Swarm and college football with Jay Christensen and make their picks for the week. Jim & Trent open up the show talking about Iowa and Iowa State in the college football playoff rankings and the disaster that is Maryland football and DJ Durkin. Big 12 football talk with Pete Mundo from Heartland College sports and then the guys finish up with some talk on Halloween and the night in sports with MACtion and NBA. Matt Campbell talk to the Browns, Jimmy B talks dildos in Buffalo and then NFL trade talk and more with Andrew Garda from Pro Football Weekly. Then Jim goes back to his Bills well and a look to tonight in sports. Jim & Trent open up the program talking about Iowa State, the decision to transfer from Zeb Norland and a look forward. Then Iowa talk between the guys and more from Tom Kakert from Hawkeye Report before finishing the hour talking NFL from the weekend. Jim & Trent begin the program looking around sports including hits on Aaron Rodgers, Freshmen QBs squaring off between Texas Tech and Iowa State, the weather in Happy Valley and Jimmy Butler and a possible trade to the Rockets. Dr. Steven Fuller talks Hawkeyes during this week's edition of the Hawkeye Swarm and then Jay Christensen drops by to talk college football. The guys finish the hour making their picks for the week against the spread. Jim & Trent begin the program talking about Iowa State basketball and Cameron Lard still working his way into good graces and some Iowa football as they prepare for Penn State. Ian Casselberry drops by to talk about the World Series and gets ready for Game 2 tonight and Matt Nelson of Wide Right Natty Lite with a look at ISU hoops and football. Trent opens the show talking about Iowa State and Iowa's games this week, then Jim drops in. Some thoughts on the math by the Giants going for 2 last night in Monday Night Football. Sean Tomlinson from The Score then stops by with a deep dive look at the NFL including the trade deadline, NFC North and more on math. Finally the guys make their predictions for the World Series. Jim & Trent open the show talking about the Iowa victory in the wind over Maryland, some NFL talk then more on the Hawkeyes with Tom Kakert from Hawkeye Report. The guys finish the hour with a trip to the Condon Casino looking at the opening lines in college football and the World Series.